‘Un Giorno Sospeso’ consists of 8 tracks coming in just shy of 48 minutes. This is 48 minutes of excellent electronic/ambient music, this music has a wonderful textures to it. The first track Flussigirl is almost dreamy and floats along on a bed of tranquil sounds. I played the second track Se fosse per me on my show a few weeks ago and this is track that slowly build into a multi melody sound, with electronic sounds all over and a nice beat to accompany it. There are also skittish horns on this track, which is unexpected, but it works fantastically well, the song comes back down after the horns. The other 6 tracks, which I am not going to describe, but I will say that I featured both Tok and Qui on the show to highlight the music that Elissa wrote. All the music on this release is good, a real nice mix of sounds, I particularly like some of the experimental sounds that appear from time to time. If I was to offer any advice, it would be to rush out and get a hold of this album. You won’t be disappointed. Elisa Luu (Elisabetta Luciani) is a Rome based composer. She begins her music career as a saxophone player, moving freely from fusion to jazz. Elisa Luu has been involved in many music projects over the years, including fusion quartet Prodotti Speciali and Short’s Monday Night Jazz Orchestra. She participated to Berklee Jazz clinics where she got a special mention as alto sax player. In 2007 she moved forward and started to compose ambient/electronic music. She is also the co-founder of La Bèl, an Italian netlabel offering free electroacoustic music, including her own EP ‘The time of waiting’. In 2009 she released her debut album ‘Chromatic Sigh’ with Hidden Shoal Recordings. Now her new single ‘ Se fosse per me’ is out – taken from her forthcoming long-awaited second album with the same Australian-based independent music label, which is going to be released in June. 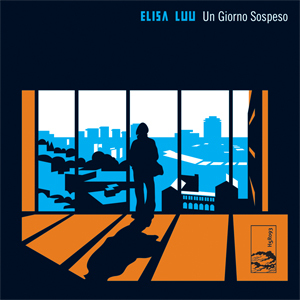 Un Giorno Sospeso is the new album by Italian ambient electronica artist Elisa Luu. As evidenced on recently released single ‘Se Fosse Per Me’, Un Giorno Sospeso is dense with chiming tones, buoyant beats, skittering horns and immersive drones. From the shimmering, levitating tones of ‘Flussigirl’ to the rattling, dark drone-beat of ‘Il Tempo Di Capire’, Elisa Luu’s brilliant marriage of texture and composition is on virtuoso display. Elisa Luu’s alchemical touch is in full bloom on this, her long-awaited second album for Hidden Shoal. Her uniquely crafted compositions carry a warmth and vulnerability that belies their digitally manipulated textures. The album takes the glorious blueprint of debut Chromatic Sigh and accentuates the highlights and shadows, making for a deliciously disorientating trip. This entry was posted on July 11, 2012, 9:08 pm and is filed under Playlists. You can follow any responses to this entry through RSS 2.0. You can leave a response, or trackback from your own site.